I ventured out again last night to the HRBT for another shot at some light line action. Fellow TKAA and KBF member Rob Choi called me earlier in the day and said he was heading out and wanted to know if I could join him. Why not? Well, it was the last night before the start of the full moon cycle with winds that were light and calm and air temps in the low 50's - a very pleasant and comfortable set of conditions to fish in. Unfortunately, I was unable to get out on the water early enough to catch the tide change. As a result, I only caught the last 45 minutes or so before the tide went slack. I started off the night on the right track though - I reversed my approach from the previous outing and worked the opposite side of bridge on the falling tide. I didn't notice any surface activity, so I worked my sea shad in a slow rolling fashion with an occasional twitch. On my third cast of the evening, I was greeted with a hard and firm hit by a hungry striper. He hit the sea shad some 30 yards away from me, so getting him to the kayak was a bit of a chore until I got him turned in the right direction. 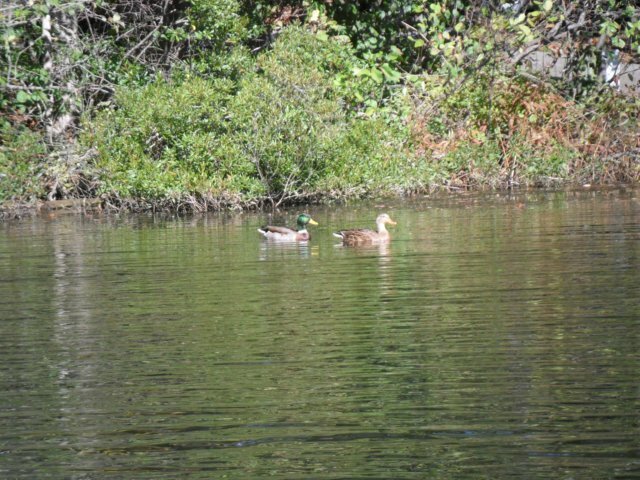 He then swam right to me thrashing side to side making the retrieve that much easier. After 45 seconds, I had my first fish in the boat - a nice chunky 22 1/4" striper. I continued that approach for another 20 minutes or so but had nothing to show for it. I caught up with Rob and his friend Dan (journeyman from VKF) and found out that they had hooked into a few already, including a hefty 25 1/2" striper that made it's way home for some lucky person's plate. I continued stalking the light line looking for any lingering schoolies but none were interested in chasing my sea shad. I changed over to a mullet pattern and immediately started getting some action, but not what I was looking for - spike specks!! I caught 2 back to back but then that bite turned off just a quickly. I decided to catch back up to Rob and Dan for another shot closer to the tunnel and found some surface activity with several stripers busting the surface chasing bait. I tried for over an hour and had nothing to show for it other than a couple of short strikes but no attempts at hook sets. The fish had dropped the mullet as quickly as it had hit it. It was just past midnight at this point, and I knew my time was getting short. In the midst of a dead tide, I decided to head back to my trusty spot from the previous trip and search for some lingerers. I moved out into the main bay side just outside the reach of the light line and cast parallel to it. I worked the mullet in a similar slow rolling fashion but keeping it in the middle of the water column with subtle rises and falls and was quickly greeted once again with a nice solid strike and immediate pull. A quick hook set and the fight was on once again. This fish was rather perturbed at being hooked, and he was determined to not come anywhere near me while I made the retrieve. 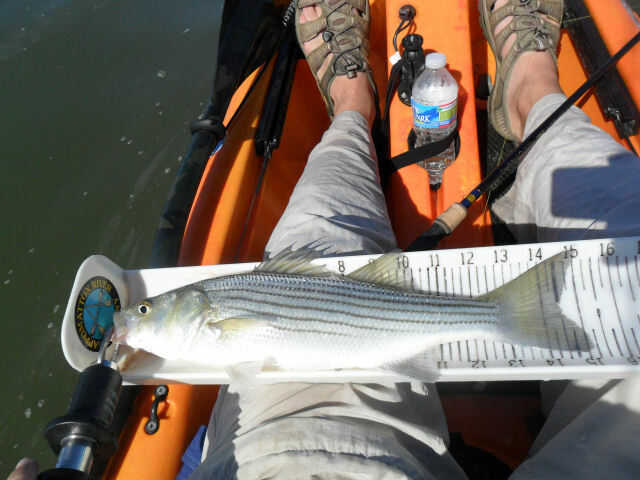 A short fight and a quick snag with the fish grips and a solid 21" striper made it's way into the kayak. I figured I might have found a small pod of lingering schoolies waiting to catch the tide change before the rest of the striper gang joined in the feeding frenzy. I made a couple more casts knowing my night was at an end and that I was going to miss the tide change and the prime feeding window. On one of my last retrieves, I felt an odd hit - almost like a speckled trout does when it tail slaps a bait fish to stun it before it attempts to eat it. I paused the retrieve as it neared the kayak and saw the silver flash right beside the kayak. I switched the direction of the retrieve subtly and felt another slap but still no take. One more twitch and I felt some resistance but not the tell-tale pull of a solid hit. I started a low retrieve and felt some resistance, so I gave a short snap hook set and was greeted with a firm pull that doubled my rod over. Drag started screaming off of the reel, and I thought I had finally hooked into my first speckled trout citation. I didn't want to risk losing potentially the last fish of the night (considered bad karma by some anglers), so I allowed the fish to tire itself a little more before attempting to bring a "green" fish into the kayak and have it thrash about risking a hook set into my leg. As the fish starts to tire, I notice it is not the citation speck I was longing for, rather another striper - this one at 21 1/2". Not stellar by any means but still a good fight. At this point, I know my night is just about done, so I make one last cast using the same retrieve pattern as before and was greeted with another solid hit. Fish on again - long story short, another 21" striper. This one had somehow nicked an artery or gut its gill and was bleeding everywhere. I thought that this would be the one time I was forced to carry a fish home, since I always practice CPR (Catch, Photo and Release). I shone my head lamp down it's mouth only to see that my hook wasn't even set. it was just laying against one of the gill plates. I reached in with the pliers and out it popped with no effort at all or damage to the fish. The fish is thrashing all over the place and covering me in blood, so I put him back in the water. He tore off like a top fuel dragster no worse for wear. As I was stowing away some of my gear, I get a call from Rob saying that he is almost back to the launch. I later learned he had got into over a dozen stripers that night - a far cry better than myself, but then again I am still learning how to chase fish at the light line. Until next time - get out, get bit and tight lines!! 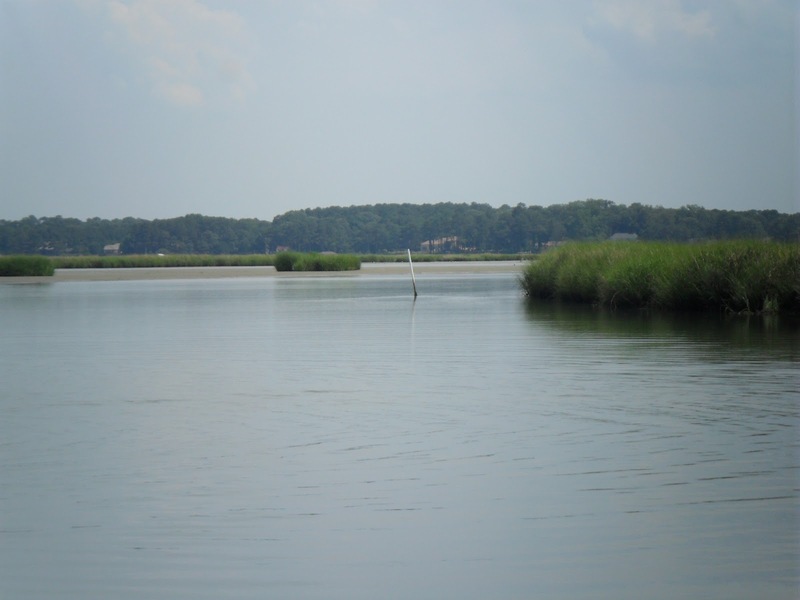 Anglers on the east coast have long hailed the abundance and variety of the fish you can target in the Hampton Roads/Chesapeake Bay region. From the citation flounder and speckled trout found all throughout the tidal creeks and rivers, to the sheepshead and tautog found near the CBBT and the bull reds on the Eastern Shore and off of the Sandbridge Pier - there is a little something for everyone. One of the more popular species to target this time of year is the striped bass. From the citations stripers off the coast of the Eastern Shore and York River to the schoolie action found near "light lines" in and around the region, they are a targeted species and one that puts up quite a fight on light tackle. The most notable light line being that of the HRBT or Hampton Roads Bridge Tunnel. For me, finding time to make it out there during the week usually doesn't pair well with my work schedule and having to be up and ready to roll at 5am every weekday. A lucky star must have been shining down on me this past week, because I was able to make time to get out one evening under mild conditions and have a night to remember. The biggest challenge my fellow kayak anglers always caution newcomers about at the HRBT is the small craft traffic in and around the area. When fishing at night, it is always best to make yourself as visible as possible to decrease the chance at getting run over. Avoiding the small craft channel is a good option as well. Of course, sporting any reflective gear on your person and on your kayak only makes you more visible. Combine that approach with a high visibility hat and/or top paired with my trusty VISICarbon Pro kayak specific safety light and you have a winning formula for the start of a safe outing at night. As for my evening on the water, it was a night to remember. Air temps at launch were 51 degrees with a slight wind out of the south, and water temps were hovering right at the 55-57 degree mark depending upon your depth. The night started off slow, which was to be expected due to a slack tide when I was finally able to launch at 9:15pm. As I paddled out, some nearby bank fishermen were having some good luck on speckled trout by casting a jig head with a swimming grub alongside the bridge pilings and just retrieving it back. I had brought only 2 rod combos to simplify my evening on the water. I paddled out and started scanning the area for any activity and used my fish finder to help mark where the schools of bait fish were at. After 45 minutes on the water, I landed my first fish of the evening - a feisty 20" striper. I landed him on a plastic sea shad rigged on a 1/4oz jig head. I kept working the same area but found nothing. 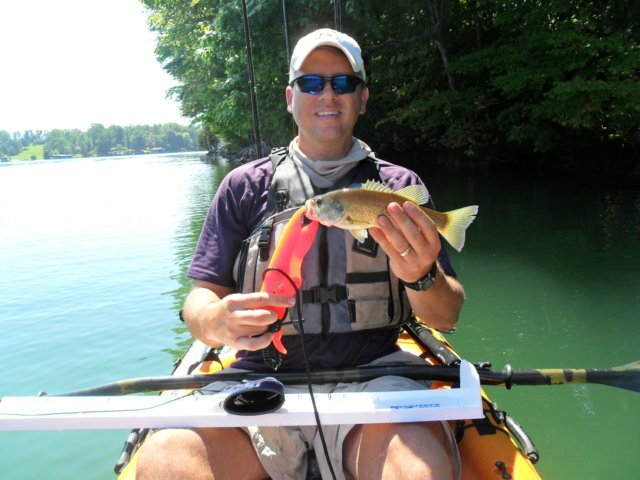 I noticed my friend Simon from KBF was peddling around in his Hobie Revolution looking for fish as well. He had only caught a few up to that point, but he and another KBF friend started earlier than I did. By the time I landed my second fish of the evening, a 12" speckled trout, both Simon and Steve were calling it a night and heading back in. I landed the trout using the new Marsh Works 3" Bayou Thumper in Voodoo Brew color using a slow crawling retrieve with an occasional short vertical twitch to create additional noise. I wasn't able to use the Thumpers in earnest tonight, because the bluefish were stacked up in numbers and were chomping off the tails of them. Color wasn't that big of a concern for some reason, as long as it had some measure of a dark outline. I used a variety of colors from traditional sea shad, to a blue sea shad and even a greenish tinted sardine - all were hammered by the stripers. I even tried my favorite color - a salt and pepper shad but they never moved or even showed any interest in them, so back to the other darker colors. A short while later, the incoming tide started to move in earnest, and I noticed surface activity almost immediately. So I paddled over to a spot and waited looking for the tell-tale "torpedo" shapes in the water chasing bait fish. Sure enough, there they were - stacked up 3and 4 deep nailing anything that dare stray too close. For the next hour and a half, I spent the majority of the time fighting the current and wind to maintain my kayak position. I had switched back to the sea shad soft plastic, since all of my Thumpers had been chomped by the bluefish. I also ran into Forrest from TKAA, so I chatted with him for a bit before heading back to my spot and trying to land a few more. In between paddling and maneuvering, I managed enough well-placed casts to land 14 more stripers, the largest measuring in at 23 1/4" and the smallest at 19 1/2". Total catch for the evening was 17 fish with only 3 misses - a total catch length of 332" of striped bass and 12" of speckled trout. As the morning wore on and the tide began to get a little stiff, I forced myself to leave and head in even though the bite was still going strong. It was 3:30am when I finally managed to pull out of the parking lot and start to make my way back home. The one downside to this whole trip was that my original day off on Friday was cancelled, so I was going to be one tired individual by the time I got home. Well, I pulled into my driveway at 4:45am and set my alarm for 5:45am to try and get some semblance of a nap before having to get up and off to work shortly after 6am. My body is paying for it now, but it was worth it. 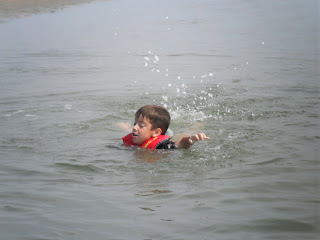 This past Friday and Saturday were spent in historic Colonial Williamsburg on Waller Mill Lake. 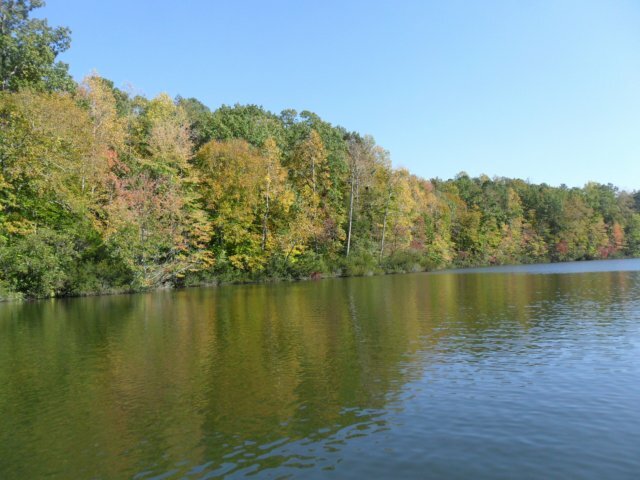 The lake is situated in a tranquil secluded section of Williamsburg and is quite a beautiful place to visit if you have the chance. It is not free, but the cost to enter ($2) and launch your own kayak or canoe ($6) is minimal and well worth the cost if you plan on spending the day on the water. 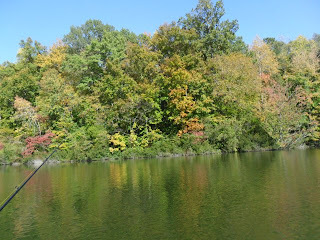 Fall in the state of Virginia is a wonderful sight to see and well worth the experience if you can find places that have nature during the seasonal turnover for fall. The scenery and the wildlife speak for themselves. 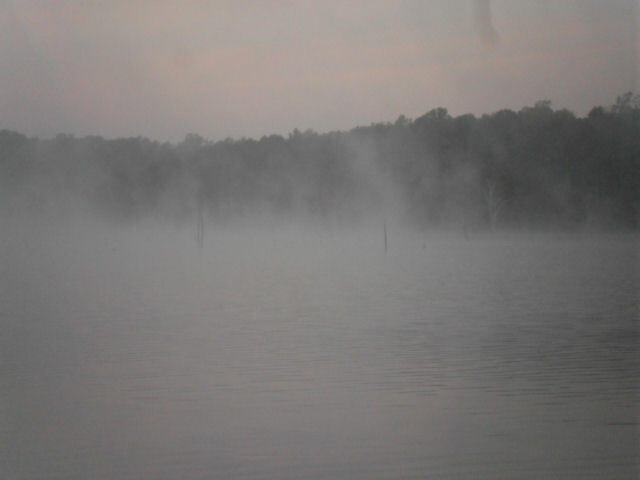 In the midst of all this scenery is a pretty awesome body of water. 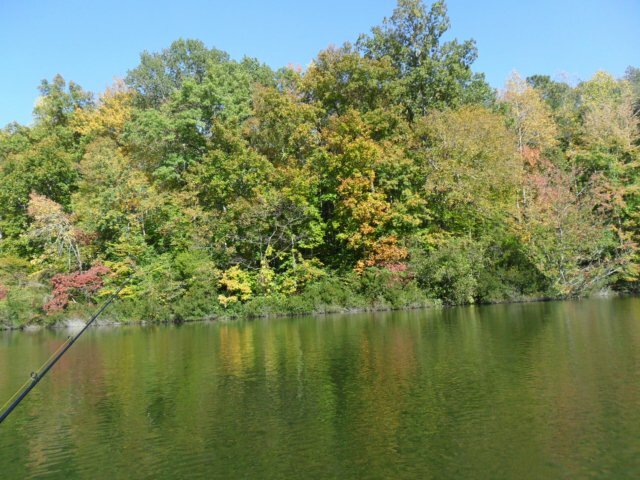 Waller Mill has plenty of fishing opportunities for various angling aficionados. For me, I was there to target Largemouth Bass and possibly some Striped Bass over the course of the two-day outing. The first day was focused on Mr. Green in hopes of improving my current fish for the KBF October Team Bass Duel. The month of October and the fall transition have not been kind to me at all. On Friday, I fished for 7 hours in the grueling winds and landed 3 greenies. The first two fish were both 12 1/2" and caught on my new favorite soft plastic lure - a Confidence Baits Floating Bird mounted on a 1/4oz. Draggin' Head. The first fish was caught tight against the bank snugged up against a submerged brush on the large Floating Bird in Dark Brown. I had cast to the spot 5 separate times all near to the same spot but never quite perfect. On the sixth cast, I placed snug against the brush and let it fall to the bottom. I gave it one small twitch and let it sit like Jeff Little preaches during this time of year. 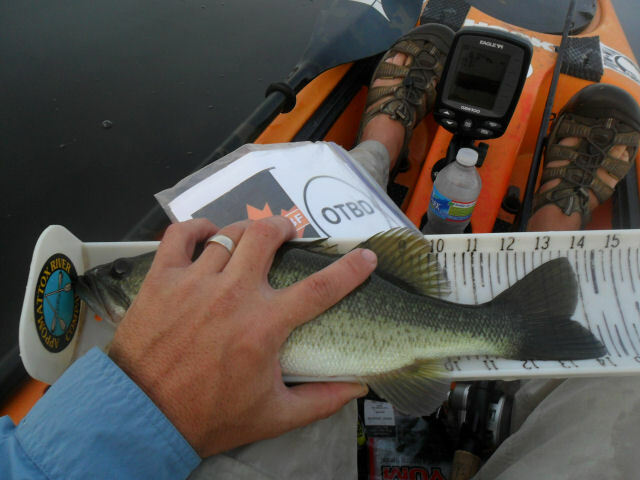 A few seconds later, the subtle tick tick of the feeding bass is felt and fish #1 is in the kayak. A little later, I moved through the tunnel connecting the lower lake to the smaller and shallower upper lake. I made my way into a channel in hopes of escaping the wind, but Mother Nature was not kind to me. I made it all the way back to a sheltered section only to have the winds shift on me and start blowing in earnest right at me. I was able to mark some fish on the paddle into the cove and found a prime spot with some submerged timber with some fish stacked up all around it. These fish were snugged up tight to cover such that any presentation an inch or two to the left was surely to be ignored. I spent some time working farther up the creek but made a mental note to try the spot once I returned. I saw bait fish busting all around, so I pulled out the trusty Floating Bird again, only this time I switched it over to the new Blueberry color and worked it like a minnow darting and twitching near submerged brush piles and trees. A few minutes of fast twitching was just enough to at least stir up some interest, so I figured it was time to work the twitch twitch pause technique deeper into the cover to try and tempt those finicky fish out and attempt a strike at my bait. Patience paid off on the third cast parallel to a brush pile to the outermost bush. I cast the Blueberry Bird a few feet past the outer bush but allowed it to fall first before giving it a subtle hop. I was promptly greeted with the subtle tap-tap and set the hook. Fish #2 in the kayak, but I knew it wasn't going to be the big fish of the bush but alas any fish is better than no fish I always say. When the fish showed waning interest in this approach, I switched over to another favorite of mine - the suspending Mirrolure. I chose one that closely resembled a shad and cast it out into the middle of the creek. I noticed the shad busting all around, so I figured a fast erratic motion would do the trick - nope. Okay, let's try the next retrieve pattern - twitch twitch pause........twitch twitch pause..........nothing. Let's try a slow retrieve with a subtle twitch........I allowed it to fall a couple seconds before slowly retrieving it. I reeled it back for a few seconds S-L-O-W-L-Y (which is painfully difficult to do with a 6.4:1 ratio Abu-Garcia Revo S) then one subtle twitch.......FISH ON!!! This one was pulling a little better than the other two and putting a nice bend in my St. Croix Mojo Bass Slop-n-Frog rod, but I knew it wasn't the lunker I was searching for. Still, it was the best one of the day measuring in at a shade under 14 3/4". The shad stopped busting at that point, the bite turned off as well, so I called it a day and paddled back in to head home. I had the opportunity to head back on Saturday only this time with my son anxious to get on the water with me, so I lept at the chance. The day had the potential to come to a screeching halt before we even left the house. The night before, I had spent some time rigging my Shimano Crucial Swimbait rod with a fish finder rig. I also took the time to pre-rig my son's rod with a 1/4oz. jig head to be used with a Gulp! Pogy. I figure, one rig to use with live shad and another to mimic a shad profile to catch the more aggressive fish. I loaded the Crucial into the van Friday night, and set the other rod out to be loaded on Saturday after my son's baseball game. As I was walking out the front door with his rod in hand, the rod tip got caught on the door frame somehow and was promptly severed clean when the front door shut on it. Oh well, no big deal. I have two other rods in the van already that can quickly be setup for my son once we get there. I'll just put his clothes in the van on the passenger side rear seat and we'll be off. As the van door begins to open, I hear the tell tale sound of splintering and cracking only to learn that somehow my Crucial rod (all 7'11" of it) had somehow become dislodged from its holder that morning and was wedged against the van door. When it opened, the bend at the tip was too sharp of an angle to save it from breaking and it promptly snapped. Two rods lost in a matter of 30 seconds of one another. Not the way I planned on starting my fishing outing with my son. We headed out anyway not letting this get us down. We get on the water by 3:30pm in time to hopefully get the evening bite before we have to get off the water at 6pm since the park closes at 6:30pm. We met up with a fellow kayak angler that lives nearby and start searching for the fish. I landed the first fish of the day - another spunky 12 1/2" greenie in the same type of location as the day before. Our friend Craig had the live shad he had cast netted a short while before. He was was working two rigs at the same time - a float rig and a fish finder rig. He found a school of catfish that gave him a brief workout for a period of about 30 minutes until he ran out of live shad, and one actively feeding largemouth that was the same size as the one I had just caught from the same general area. Since we didn't have any live shad, we stuck with the Gulp! Pogy worked slowly along the bottom like a live shad. A few minutes later and about a half-dozen missed strikes, my son gets his first fish of the day - a nice chunky 12 3/4" slab of Black Crappie. 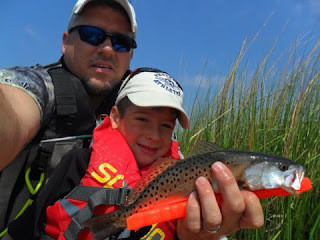 We headed in shortly thereafter having each landed a fish and having a fun day on the water. 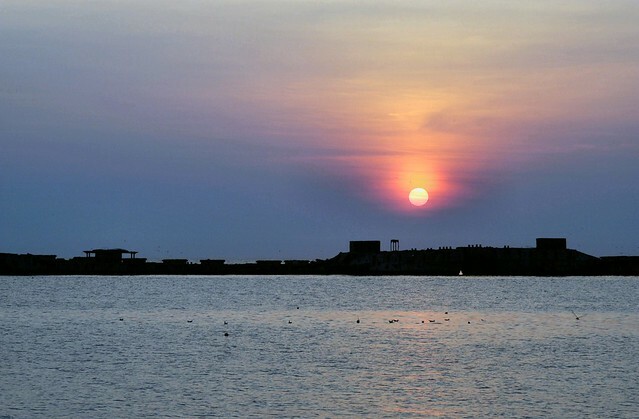 As the sun began to set, I realized how wonderful the day was even though it had not started out that way. Funny how time on the water and a couple of fish caught can chase away those bad vibes that threatened to cloud up the otherwise sunny day. This past weekend was a logistical nightmare for me. The weekend was going to involve a lot of driving, a sore back and little sleep. Friday started off fairly calm, but the winds started to blow in earnest by mid-morning. Not to be deterred, I headed down to the peninsula for some fishing. I made a stop over at Back River Outfitters to meet Kathy finally and to help out the local economy by adding to my Mirrolure collection. I made sure I was through the tunnel before traffic started to get too bad. The wind was pretty rough out of the west while the sun was still up, but it quickly tapered off once the sun set. When I crossed the HRBT at 3pm, the wind was ripping straight down the river from the shipyard creating some massive swells with what looked like 4-5' rollers and whitecaps. I got to the Owl Creek ramp and met up with a fellow TKAA and Pirates Of Lynnhaven member Joe (Agent VA) and chatted with him for a few minutes before launching. I fished from 4:30pm until 8:45pm just shy of moonrise which is when I am guessing the bite turned on. As I said earlier, this weekend was going to involve a lot of driving, so my time on the water was limited and precious. I knew that I had to be on the road by 8 AM for a planned day with the in laws, my wife and son and her brother's family. We were heading to Gross' Orchard for the fall festival and some apple picking. Anyway, I hit the usual spots (the grass island, research/police docks, shallow cove, etc) and marked literally hundreds of fish stacked one on top of another from 1' - 5' below the surface in water 8-12' deep. There was plenty of surface activity with either glass minnows or finger mullet being chased by juvenile specks and what looked to be either mullet or bluefish. I ended the night with only 3 spikes all in the 10" class - nothing photo worthy, but I did lose a nice flounder under the science center. Surprised me that he was there, but when I laid my vertical rods down and paddled under the science center's overhang to get a quick scan using the FF, I saw a ledge that dropped from 3' down to 7' where he was staged. Not sure whether he will be there again, but it might be worth a shot next year when the flounder move back in for the summer. I found a school of nice sized specks near the museum and chased them for the better part of 2 hours without a single bite. 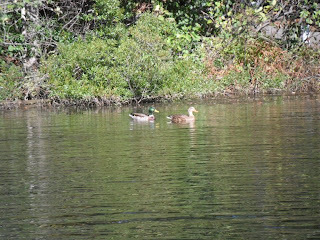 I had several follow aggressively right up to the side of the kayak then turn away. I used everything I had with me to entice them - Gulp Swimming Mullet, Badonkadonks, Marsh Works Bayou Thumpers, and MirroLures but to no avail. Since the fishing was not speck-tacular, I decided to call it a night and head home. Got home around 11pm in time to let the dogs out, give them a late snack and try to get 5-6 hours of sleep. 6am came way to early for me, but I dragged myself off the couch and started the painful task of unloading all of my gear from the previous night. Most people would just leave everything in place, which I would typically do, but alas the family outing for the day involved my van being the primary form of transportation and needed to seat 5 adults and my son. Once everything was unloaded and stored inside, I headed out on time. The trip to her parents isn't long by any means, it is just tough after working the previous day, fishing that night and getting minimal sleep. After the day was over, I drove home in time to let the dogs out once again and feed them. The original plan was to meet up with fellow kayak angler and friend Rob Choi for some light line action, but neither of us were up for it. He and I both had the family thing going on Saturday. 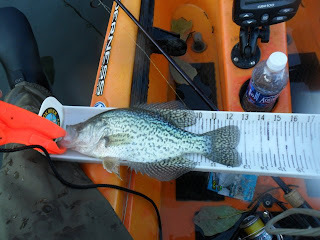 Sunday morning came, and I was determined to get out on the water again, only this time in the freshwater. I went to a fairly quiet small lake in hopes of landing a nice bass, but I arrived at the lake to find it swollen from the massive rains recently to the point that the spillway was useless. The water was gushing over it and had risen so high that the surrounding dam was overflowing with water careening over the top. The wind was gusting yet again with sustained winds in excess of 15 mph and gusts of up to 25mph. Holding position was nearly impossible, and the water clarity was almost non-existent and was stained like chocolate milk. Visibility was 0-6" - no lie. I fished all of the normal fishy spots but couldn't buy a bite - nary a swirl even. I was using a variety of tactics with moving nosy presentations as well as flash (ie: black buzz frogs, chartreuse/black rattling crankbaits and a large colorado-blade gold spinnerbait - nothing. I ventured back into a dense lily pad section of the pond that is nearly impenetrable during the peak bloom, but now I could manage to navigate through it with fall fast approaching. After a 30 minute trek through the pads, I get my first strike but missed the fish. I was lifting the frog out of the water by the kayak when it happened. I could hear surface activity all around me - the telltale popping noises from bluegills nailing bugs and insects in the pads. A sure fire indicator that bass should be in the area. I would see and hear the occasional flush of a feeding bass but couldn't hook into one or even entice a bite. I got a call from the wife saying she was leaving her parents house, so I knew my time on the water was about over. I decided to start making my way back to the launch and fish some of the other prime spots, but Mother Nature was not having any of that. Just about the time I would get the kayak positioned correctly and start to make my cast, the wind would start gusting from the wrong direction. I finally just chalked it up to a bad day on the water and paddled in. While I didn't catch anything on Sunday, I still had fun with two friends from KBF. I hope to try again this weekend one last time for some bass before moving my approach to the late fall/early winter salt water chase. See you on the water!! First of all - thank you HOOK 1 and the KBF Christmas in July contest. I was fortunate enough to win a prize or two, most notably - the new Leverage Landing Net BC-1900 model. An innovative design concept that is long overdue. The net itself is fairly easy to use and provides the proper leverage for hoisting a fish out of the water and into your kayak. It is lightweight relative to its overall size and with the long handle design affords the angler some additional length for netting a fish before it gets to the kayak and gets spooked further, possibly throwing the hook resulting in a lost fish. Storing the net is fairly straight forward albeit not as seamless as I had hoped. There are some considerations alluded to below one must take into account before opting for this style of net. Most notably, the design incorporates an extended handle for storing the net in a rod holder when not in use. This design assumes that the angler has a rod holder to use exclusively for the net. For me, this feature is a challenge on my current kayak. I do not have the traditional angled flush mount rod holders seen on many kayaks these days. I only have the tubes on my milk crate. Storing the net in one of those holders when the crate is stored in the traditional fore or aft position is not practical if you are carrying more than one rod, because the net will get foul hooked on any hooks nearby whether they are swinging freely or secured to the rod. To overcome this small inconvenience in the short term, I simply store the net in the rear tank well. For the long term, I can solve the rod holder challenge using a two step process. First, I turn my milk crate so that the rod holders are all of the left side of the kayak. I normally use just the rod holders for my rods, but I can also use my two adjustable Scotty rod holders I have installed using the flush mount bases and lay my rods in a horizontal plane. This would facilitate placing the LLN in the rear rod holder farthest away from the rods and where the hooks of the lures are stored. Second, the next item that is more of recommendation than actual complaint is when the net is folded for storage. You need to unhook the securing strap that keeps the net in an open state in order to take advantage of the compact storage design. Not a real deal breaker for me, but nevertheless, it is does require two hands the first few times until the firm rubber strap becomes pliable enough to slip over the securing post freely using one hand. Its difficult to wrangle a fish to the kayak with one hand while you are attempting to retrieve the net from the rear tank well and secure the initially rigid strap with your other hand. By the end of a 3-day fishing weekend, the strap was starting to become easier to manage. Like I said, not a deal breaker, just an observation and potential area of improvement moving forward. Fortunately, the designers included an extra strap in the event the original one ever breaks or is lost. My third concern is only applicable when the net is stored in its intended folded state. While folded, the net has a tendency to gather at the hinge point. When this happens, the ability to open the net and lock it into position is compromised, because the net gets snagged and prevents a full opening sequence. Here in lies the issue like noted before. When you are fighting a fish with one hand and having to fight with the net opening and then securing the strap with the other hand, it does make it kind of difficult and challenging. I solved both situations by storing the net in the open position with the strap secured both the shaft was folded. I then simply laid the net in the rear tank well under the furthermost rear bungee. When I needed the net, I turned slightly and reached for the handle. I then slipped it out from under the bungee and deployed the basket of the net and locked the shaft into position. On a side note, I found another excellent use for the net. While my son and I were at the launch preparing to load up and leave, a gentleman was hand lining for crabs using chicken legs. In order to catch these crabs, you need to be able to scoop them up as the line is lifted from the water. The challenge here is that the crab usually sees you first and lets go before you can scoop them up. Not a problem. The Leverage Landing Net saved the day and helped the older gentleman net 12 or 13 nice crabs for dinner. With the LLN, I was able to place the net in the water first, lift the lines and place the net under the crab before ever getting them to the surface. Once the net was under the crabs, they simply dropped right into the net. Herein also lies another feature that is a nice feature. The net material is very sturdy and can stand up to the rigors of different feisty water creatures. In the last couple of weeks, the net has been used on bass, crappie, chain pickerel, catfish, speckled trout, flounder, striped bass and now blue crabs!! 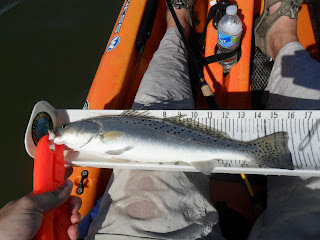 Overall impressions are that the Leverage Landing Net is an A+ product in my opinion - only a couple of minor concerns based upon an individual kayak anglers preferred rigging setup, not necessarily 100% attributable to the design of the net. Nevertheless, these items should be taken into account relative to your own kayak rigging options if you are considering purchasing one for yourself. 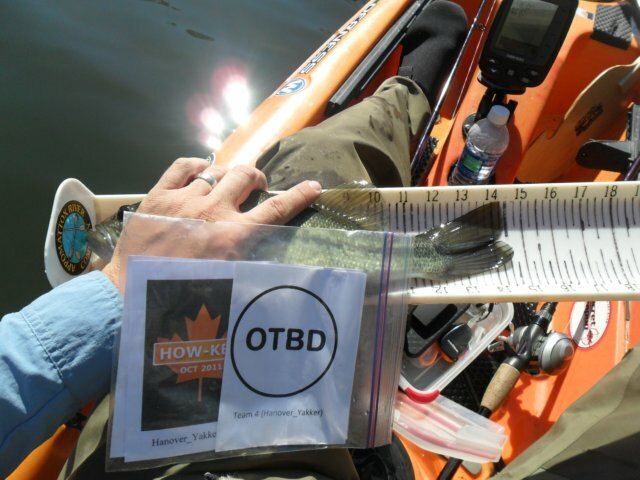 Again, thanks to the folks at Leverage Landing Net for catering one of its products to the kayak angler world. And to HOOK 1 and the KBF Christmas in July Prize giveaways. I am very pleased with my Leverage Landing Net and look forward to using it often!! You should add one to your kayak arsenal of accessories as well. You can find them at HOOK1. So, today was the Columbus Day holiday and what better way to spend a holiday than to take a day off from work and take my son fishing, since he had the day off. We loaded up mid-morning, since there was a full moon last night, and headed out in search of some fish. 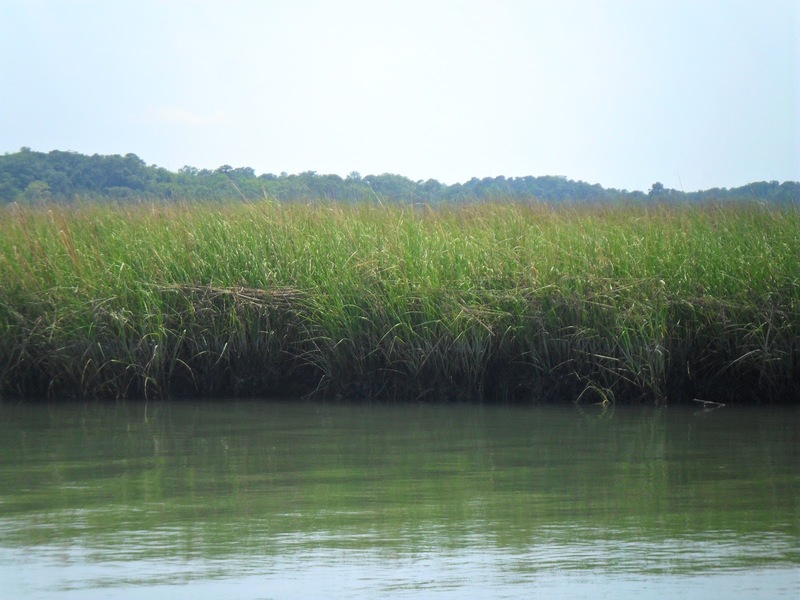 I originally planned on hitting up Lynnhaven or possibly Rudee, but I wanted to avoid any potential holiday traffic at the tunnel, so I stayed north of Hampton and ventured out onto a tributary of the York River. 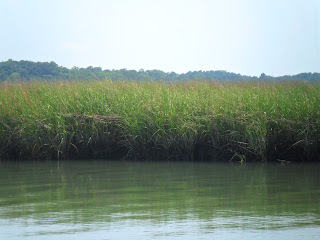 Our original plan was to hit the creek mouths on the falling tide and search for some specks. On the second cast, I hooked into a spike trout right at 8" that has some nice fangs but alas was a runt nonetheless. Not a good sign........we paddled out anyway, We spent some time bouncing jig heads along the bottom and quickly landed another salty creature - a blue crab. Doh!!! Not exactly what I was looking for. Keeping an eye on the depth finder, I noticed that most of the fish were suspended about 4' below the surface but not tightly schooled up. More like a random pod of fish with only 3-4 spread out in various spots all over the river. I took a moment to switch out our lures to a Bass Assassin in Sea Shad color. I threw mine out to bounce along slowly as I showed my son how to rig a plastic shad on a jig head. As I was showing him how to make sure the back and body was straight on the hook, my rod tip does 2 quick bounces then a straight pull and started moving. I grabbed the rod quickly and gave a sharp rod set - FISH ON!!! The fight lasted for over 2 minutes with the fish pulling drag every chance it could. This fish fought like a striper, which have been known to show up all over the York. Something didn't feel right though - I got it to the kayak and it rolled. Was it big Croaker? It only looked a shade over 12", so it could be possible. There are some horse Croaker in the York as well. 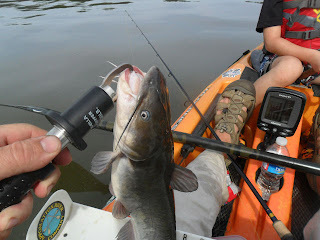 Not to be - alas, a dang catfish!!! 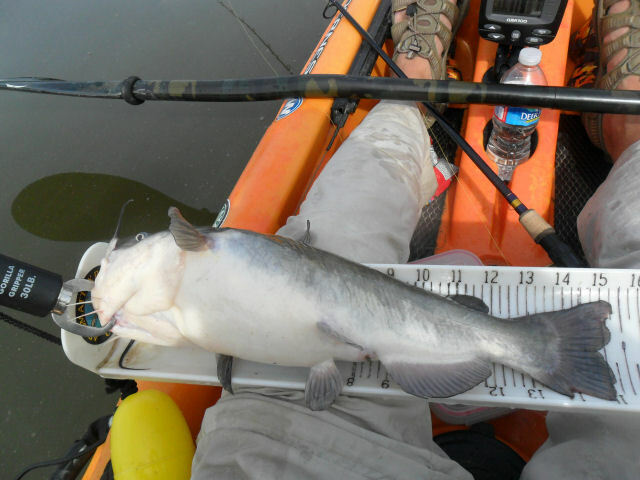 I used my new 1900 series Leverage Landing Net to coral this feisty whisker kitty and in the kayak she ended up. After a couple minutes to get things organized, I managed a couple pics. This sucker was chunky!!! Look at the girth on this sucker. I bet those would be some tasty filets, but I released him back to the water. Not our target species for the day. After that, nary a bite was to be found. However, it doesn't mean the fun ended there by any means. 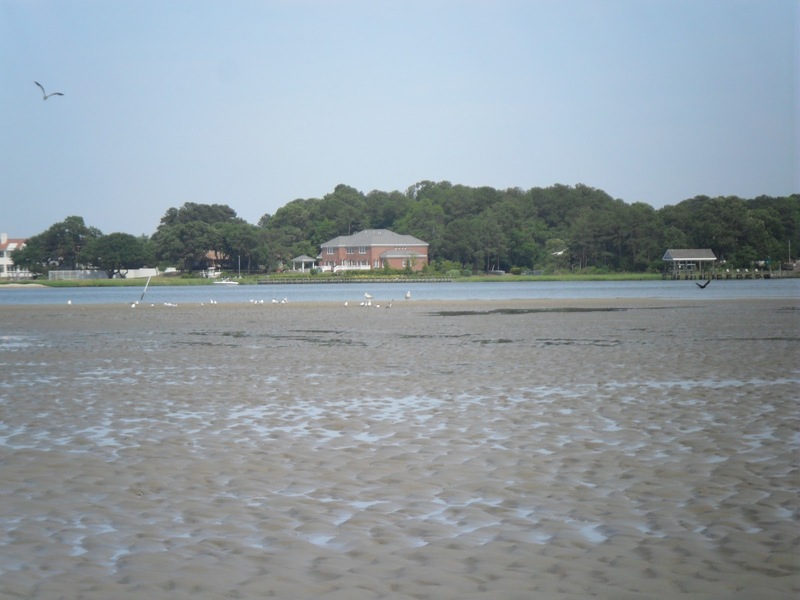 We kept paddling around and explored a couple more creeks at low tide. I had the fun of showing my son Fiddler Crabs for the first time. 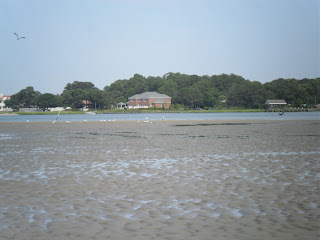 He kept an avid watch on the shoreline looking at the now exposed mud banks and the holes that the fiddlers call home. Every time he would see one, I was greeted with a loud "Daddy look - there's another one!! They are funny daddy!!" The best part of the day was when we got to watch a bald eagle soar from his lofted perch right off the bow. We watched in awe as he soared skyward and land gently and confidently a few hundred yards away. Still visible, but concealed to the naked eye for those that did not see him land there. We kept paddling about watching the herons chase mud minnows in the shallows for a bit. We even saw a species of fish I am clueless about and can only describe. The fish would literally poke its head up out of the water look around then disappear just as quickly. The fish looked to be a muted grey with black blotches. Strange but cool. We reached the end of our initial drift/paddle and made the turn for home. We passed by the eagle's last know perch. Right as I opened my mouth and said to my son, "Oh shoot buddy, I think the eagle has flown away", he took flight from his hidden perch and soared yet once again in front of us to stare in awe and wonder. Sorry for the delayed report - it was a slow day as I figured it would be. 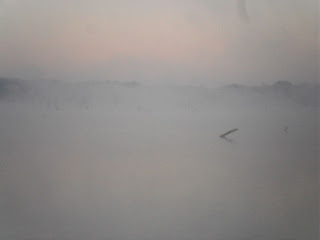 I managed some bites early on due to a lingering fog that had moved in overnight and lasted through 9AM. Nothing of any significant size to report unfortunately for my partner AJ in the KBF OTBD Challenge, but it was still great getting out on Briery for the first time this year. One of these days, I will hook into one of the famous Briery beasts, but alas it was not to be yesterday. Maybe next time. Spoke to a few others that were fishing there the last few days, and they also confirmed the bite was off. Most folks were catching the fish by drowning large minnows in 9-15' of water on a slip bobber. 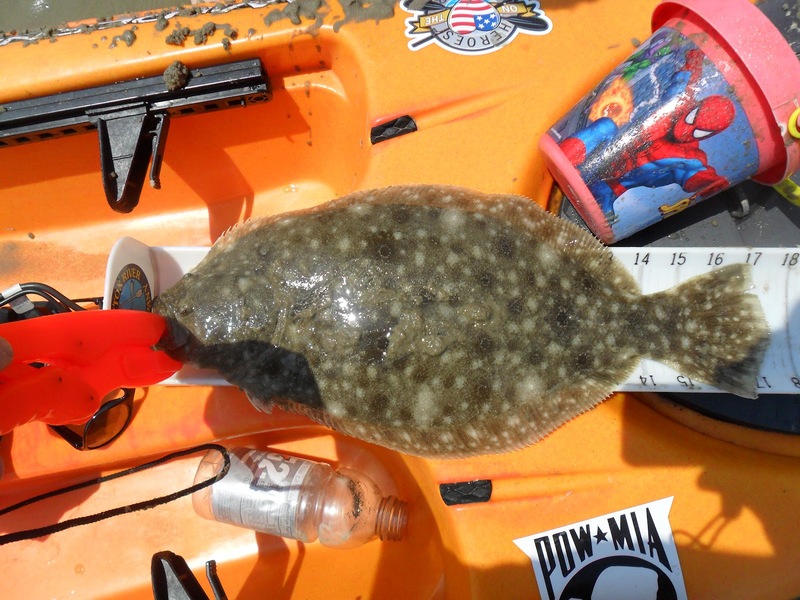 Sorry, but I am not a fan of watching a bobber for 8 hours, so I spent most of my time paddling around checking out shoreline structure and shallow coves. Water temps peaked at 74 by mid-day and were in the high 60's at launch even with air temps in the high 40's. All bites and landed fish were caught on my favorite lure - the Stanley Ribbit, by working pockets in the pads, edges of the pad line and between the nooks and crannies of visible structure of the tree tops. Both fish were caught in 3.5' of water early in the morning before the fog wore off. I went against my normal mode of minimalist, because I wanted to avoid changing up presentations on each rod. I carried 5 rods - 1 frog, 1 jig-n-craw, 1 SWL Clacker Spinnerbait, 1 Castalia Bombshell Turtle and 1 Shakey Head that also served as a fluke rod. Could not establish any pattern other than the fish were holding in 5-9 feet of water and not active. The bass were schooled up with the crappie and holding tight to cover. Even dancing a fluke or dead sticking had no reaction at all. Near mid-day, the bite appeared to turn on somewhat again, because I was seeing surface strikes all around the wind-blown shallow coves, and I was getting consistent hits on the frog but they were all misses. Still fun to get out and spend some quality time on Briery doing some recon for a potential spring time outing. Today was a day dedicated to chasing Speckled Trout. I was joined today by fellow KBFer Simon (aka SimonSays) to hit the Back River. Prior to the outing, I passed along the tips and pointers that had been passed on to me from past outings with other members both from TKAA and KBF. I launched at 5:15am from a launch off of Poquouson Ave. and Simon joined me at 7am from Messick. We met up and started our search. Finger Mullet were busting the surface all around us, but we had no luck early on. A closer look revealed that Ribbonfish and juvenile Striped Bass were primarily chasing the Finger Mullet with an occasional speck thrown in for good measure. I was throwing everything I had at them today and not getting so much as a single serious bite. I mean, I started with a top water mullet impersonation - not even a sniff or short strike. I switched rods and started working a crab impersonation plastic - nothing. Switched rods again and started casting a Mirrolure suspending twitch bait. Still nothing. Switched rods and tied on a Gulp! Swimming Mullet. I even stood up at the mouth of the coves and attempted to see what was going on in the relatively clear water for any signs of activity - nothing. Time for Plan B, I told Simon to position himself outside of any main creek mouth and cast his soft plastic back into the creek. I did the same and quickly landed the first speck - a 10" spike. A few minutes later after a few subtle hops, Simon lands his first trout - a spike at 12". Alas, he had to go back and get a little bigger. We floated along with the current but not much else happened. As Simon was about to leave, he started trolling and ended up with a juvenile striper in the 13-15" range. It was getting close to our cutoff time, so we parted company and headed back to our respective launches. As I am trolling along slowly, my rod takes a sudden bend and starts shaking - fish on! Another spike trout. I start my slow drift again, and a firmer strike happens. This one felt a little better. A short fight lands me the first keeper size trout of the day - a nice 15 3/4"" speck. I call Simon on the phone in hopes of catching him before he left for home. Just in time! I ask him to meet me at my take out if he wants it. As I am making the turn for my take out, the rod bends for a third time on the drift back. This time, it is a juvenile 15" striper.